A quick and easy weeknight dinner, roasted salmon is brushed with a fresh and flavorful honey mustard sauce the whole family will love. 5 ingredients and 15 minutes is all you need. We grew up eating seafood several nights a week and my mom’s honey mustard salmon was always one of my favorites. This simple 5-ingredient recipe is ideal for a busy weeknight dinner but fancy enough to serve company. Many people love to order seafood in restaurants but are intimidated to cook it at home. The truth is, fish is practically fool-proof and so easy to prepare on your own. Quick cooking and extremely versatile, salmon and other seafood can be flavored with any spices or fresh herbs you have on hand. 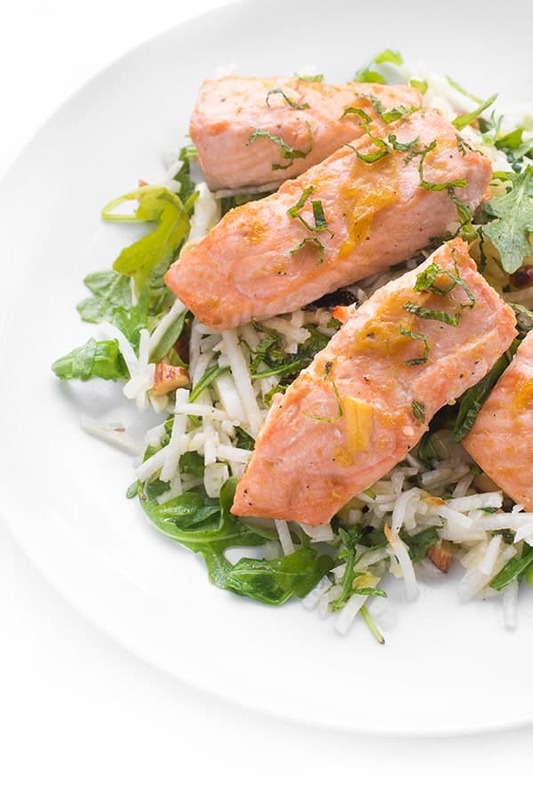 Naturally protein-packed and full of heart-healthy omega-3 fatty acids, salmon is one of our go-to week night dinners. We enjoy eating it grilled, pan-seared and of course roasted. Serve with rice pilaf and a quick green salad and dinner is done. A quick and easy weeknight dinner, roasted salmon is brushed with a fresh and flavorful honey mustard sauce the whole family will love. Pre-heat oven to 400 degrees and spray a glass baking dish with cooking spray. Place each salmon filet in the baking dish, skin side down. In a small bowl, whisk together honey, mustard, lemon, garlic and salt/pepper. Use a basting brush to coat each filet evenly with the honey mustard sauce. 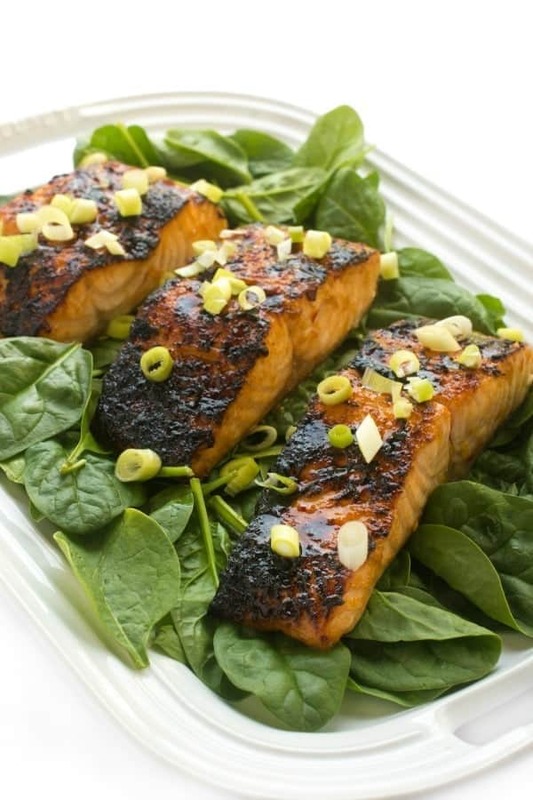 Roast salmon 15-20 minutes or until fish flakes easily with a fork. Garnish with fresh parsley and lemon wedges to serve. Oh I’m so thrilled to hear it Katie!!! Yay! This makes my mouth water. Seafood is my second love..after Mexican. Costco is such a great place to stock up!! Made it last night. My husband, who does not really like salmon, finished every bite. 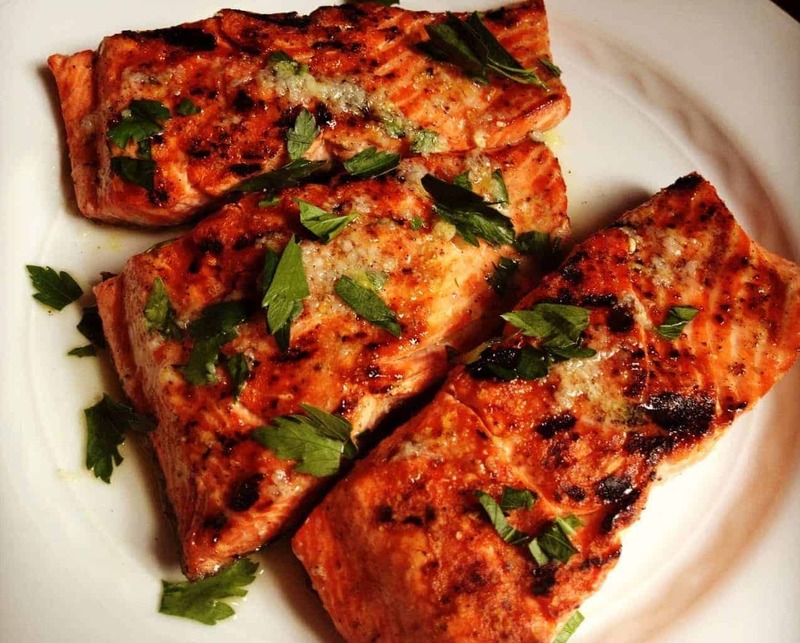 So, this will be my “go-to” salmon recipe. Thanks so much for helping me to get him to eat more salmon. Soooo healthy! Oh I love to hear that!! Thanks for letting me know!! Salmon + mustard is one of my favorite combos! Just in time for Friday’s dinner which is mostly fish. (Raised a Catholic and it is just in my DNA!) Thanks for solving what I’m having for dinner tonight. YES!! I hope you love this salmon! This is my favorite way to eat salmon. And it’s so easy. I just love it. Gorgeous photos, Liz! My Seattle-Salmon eating heart is so happy right now!! YUM! I’m so envious of all your seafood over there!!! I’m so pumped for king salmon season! My whole family LOVES salmon, so I make it all the time! Love this recipe – can’t wait to try it! I’m so glad my boys love salmon. It really doesn’t get easier or faster to make. Happy weekend friend! This sounds like a great way to prepare salmon. At some point I’m going to get brave and fix fish for dinner and get my husband to eat it… This recipe would be an excellent starting place. We’ve been eating so much salmon lately!